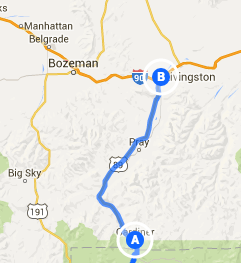 Trip Log – Day 92 – Jackson, WY to Yellowstone National Park | How Will We Live Tomorrow? The Grand Tetons are magic! I pedaled in their shadow for over thirty miles, and was mesmerized by their dynamic angles, immense scale, and the play of light and shadow. 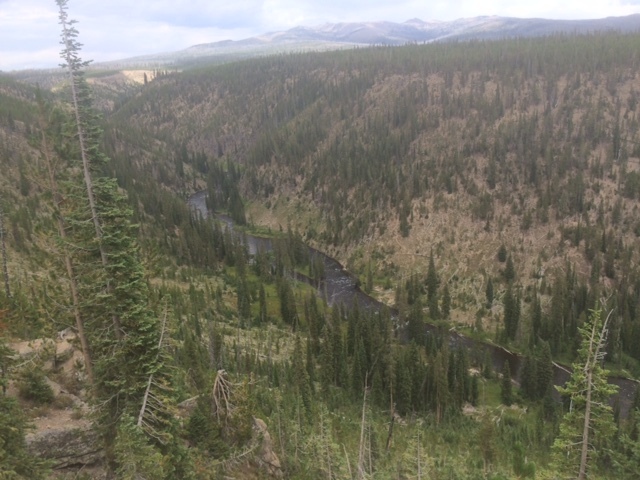 I woke to light rain and a grey forecast but pushed out for the long ride up to Yellowstone. The first twenty miles followed a new bike path out of Jackson, into Grand Teton Park, all the way to South Jenny Lake. The rain never turned serious. 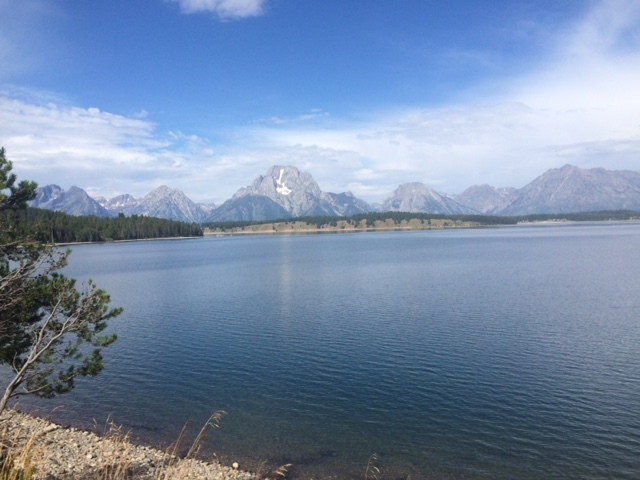 As I rode, the Tetons morphed from looming shadows to stark relief. After breakfast at the South Jenny camp area I had thirty solid miles along the Teton Range. The glacier at Mount Morain is impressive, though dwindling. The highway curves around Lake Jackson, which offers spectacular views of Morain from many angles. I stopped for lunch and enjoyed great bacon mac’n’cheese at a restaurant along the five-mile stretch between Teton and Yellowstone Parks. Refueled, I headed into a national park I have long dreamed of visiting. The southern portion of Yellowstone is the Teton’s figure-ground cousin. The Tetons splendor is easy to see: the roads in the wide valley are generous; the mountains rise like knives out of the plain. 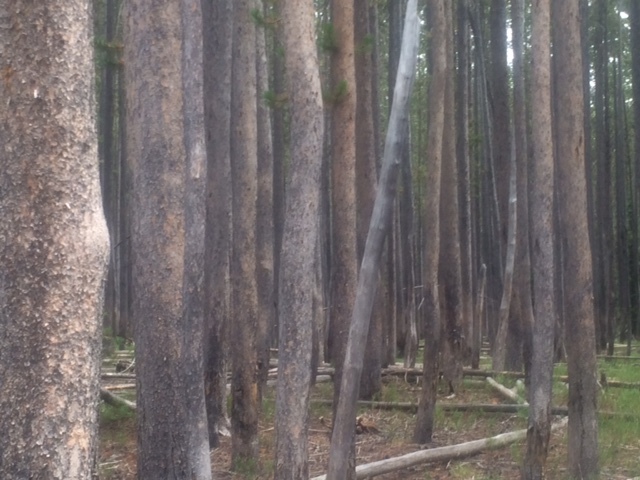 In Yellowstone, the view from the road reveals only millions of longpole pine trees. But as the road cants up, giant crevices and deep canyons fall off on either side. You have to stop at intermittent turnoffs to appreciate them. Riding along the base of the Tetons filled me with awe at the giant sculptural forms. Pedaling along the narrow Yellowstone Road with no shoulder and big drop-offs triggered my vertigo, though I enjoyed many scenic pit stops along the way. This entry was posted in Bicycle Trip Log and tagged Grand Teton National Park, Jackson Hole WY, Yellowstone National Park. Bookmark the permalink. Pingback: Featured Response: Laura Petrosillo, Expatriate, San Francisco, CA | How Will We Live Tomorrow?